With such a high standard and wide variety of excellent submissions, I found it harder than ever to pick my absolute favourite. But, in the end, Stuart Medley’s entry stayed with me and invited me back for several reasons. For starters, I enjoyed his clever composition, putting ‘The Great Tree’ centre stage across the two pages and showing the passage of time through the changing seasons and their effects on the tree as well as the characters, from summer and autumn through winter to spring. In fact, Medley’s whole spread can be seen as one single image subdivided into four time zones, with characters repeating as they reappear around the tree. It’s actually symmetrical and balanced, with three panels for each season. I also enjoyed his darkly satirical scenario about two competing businesses, Mondo Planto (clearly a dig at Monsanto) and Global Botanics, out to secure the patent on this ‘rare flora’ for commercial gain, an all-too-possible plot in the crazy world of genetic modification and corporate greed. And re-reading it reveals a further humorous twist – you gradually realise that Global Botanics have misunderstood and targeted the wrong tree entirely. They have confused geneticist Dr. G.’s ‘Grey Tree’ with the similar-sounding massive ‘Great Tree’ that fills this garden and these pages. 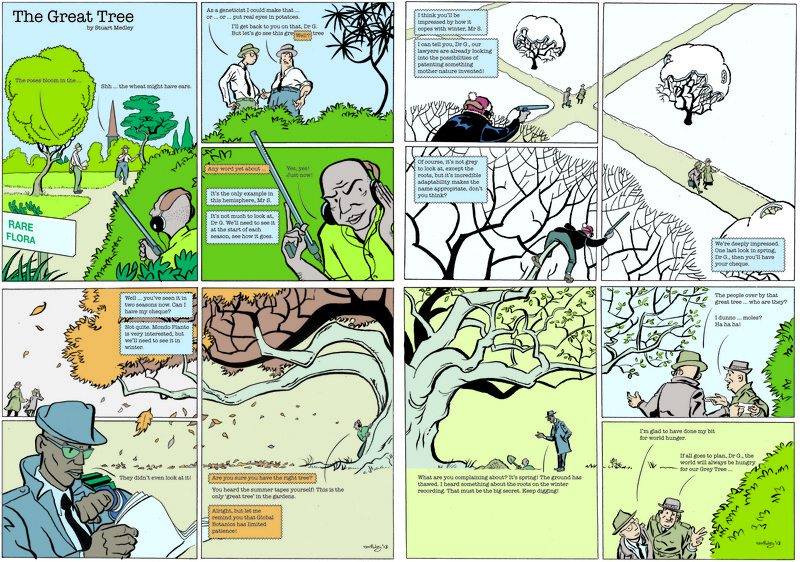 In reality, the vital specimen is the less impressive smaller tree nearby which Dr. G and Mr S stand next to in the first and final panels. Add to this the way Medley cartoons clearly and sharply and his way with witty dialogue – I especially liked Dr G.’s offer to ‘put real eyes in potatoes’ – and to my mind, you have a winner! You are currently reading And the winner is… at adventures in comics.